Falconhyrste is a young adult, coming-of-age story set in a world with magic, mystery, and a rainbow of characters. It’s also charming as heck. Today I got one of the creators of the story, Melissa Capriglione, to answer some questions for me about the inspiration and process behind making this webcomic. What inspired you to make this comic in particular? Initially, I wanted to make a comic because I needed experience in making comics! I was in my sophomore year of college at the time and, wanting to be a comic artist when I graduated, I realized I had little to no experience at making comics. So I went with the most accessible option- a webcomic! Anyone can make one, and you can host it on a variety of platforms. The story itself was inspired by love for everything supernatural, and I brought in a lot of inspiration from various anime and comics. You make this comic with another artist. What prompted the collaboration? In December of 2015, I went on social media and asked if anyone wanted to collaborate on a webcomic. Clara (now my co-author) responded out of the blue and then we began brainstorming the story and swapping sketches. Both of us were beginner comic artists and didn’t have set styles at the time, so it was tumultuous. I wanted to collaborate on the comic because we planned for it to be a larger project and I couldn’t see myself taking it on my own. We also act as each other’s beta readers, so the collaboration helps us figure out the plot and make sure our writing sounds good. It also just helps to have an extra set of eyes around for general feedback! How was the collaboration process when you started out? What kinks in the system have you had to work through? It was pretty rough in the beginning! We had no idea how long it would take us to make a page, so we were scrambling to finish our first handful of pages. It took us about an entire two weeks to make just one page, but now it takes us about a day or two. Since then, we learned a lot about formatting pages, setting them up so we’re not using 50 layers, and general streamlining of the process. This comic has been online for 4 issues now. How long do you intend for Falconhyrste to last? Since we’re printing issue four, we plan on printing issue five sometime mid 2019. The pages for issue five (and half of issue six) are all done and on the website (falconhyrste.com), so we hope to have those in physical form soon! As for the story itself, we’ve been doing this for about three and a half years now, and we’re not even a third of the way through our story! But the reason why it took us all these years to do barely 200 pages was because of our busy schedules. We were both in school when we were beginning, so we had to skip a lot of updates and take mini hiatuses due to exams and work schedules. But now I’m full-time freelance so I can dedicate more time to the story, and hopefully Falconhyrste won’t take another ten years to finish! Definitely somewhere in between! The entire script is written out in its entirety, but it’s mostly still the first draft from early 2016, so it’s not that great! We’ve kept a few parts but we’ve added and edited stuff since then. We usually try to plan a chapter ahead, though. Dang near everybody in this comic is somewhere in the LGBTQ+ rainbow – which I’m not complaining about! I also saw in your portfolio website that you call yourself a “queer artist.” Now, there are (I have discovered) LOTS of LGBTQ+ comics and creators out there. What is it about Falconhyrste that makes it special to you? Both of us are LGBTQ+, so we wanted to make a story that included people like us, as well as many other people in the community. It’s important to have queer stories available to younger audiences (Falconhyrste is classified as young adult) so that it can be more normalized. Falconhyrste is special, I think, in that we enjoy just having queer characters existing happily in a world without bigotry and adversity, and use magic! Lots more comics these days are going that route, and it’s certainly refreshing to see, and I’m glad to be a part of this movement. To create my own stories from my perspective and make the queer comics world even more colorful is one of my goals. Falconhyrste will be on KickStarter November 16 (that’s today)! Is this your first KickStarter campaign or have you run previous ones? If you’ve done it before, what have you learned from previous campaigns? This is our first Kickstarter, yes! Before this, we did a pre-order for issues one through three, and the response to it was far greater than expected, so managing all of that by hand was kind of overwhelming. I figured Kickstarter would be our next best bet because it’ll be easier to manage rewards and stretch goals, as well as communicate with our supporters on a better level. Obvious question: What tools do you use to make your comic? Is it purely digital? Yes, 100% digital! I use a Wacom Cintiq 24HD with Photoshop CC, and Clara uses a Wacom Intuos with Clip Studio Paint. Falconhyrste is a coming of age story if I’ve ever seen one. Are there other coming-of-age stories you want to write, or do you think your next story idea will be in a different kind of genre? I think coming-of-age stories are my main focus. Growing up, I didn’t have a lot of stories I could relate to and ended up being uninterested and bored by most stories. Nowadays it’s so inspiring to see comics reaching a much wider variety of audiences than they did just ten years ago! 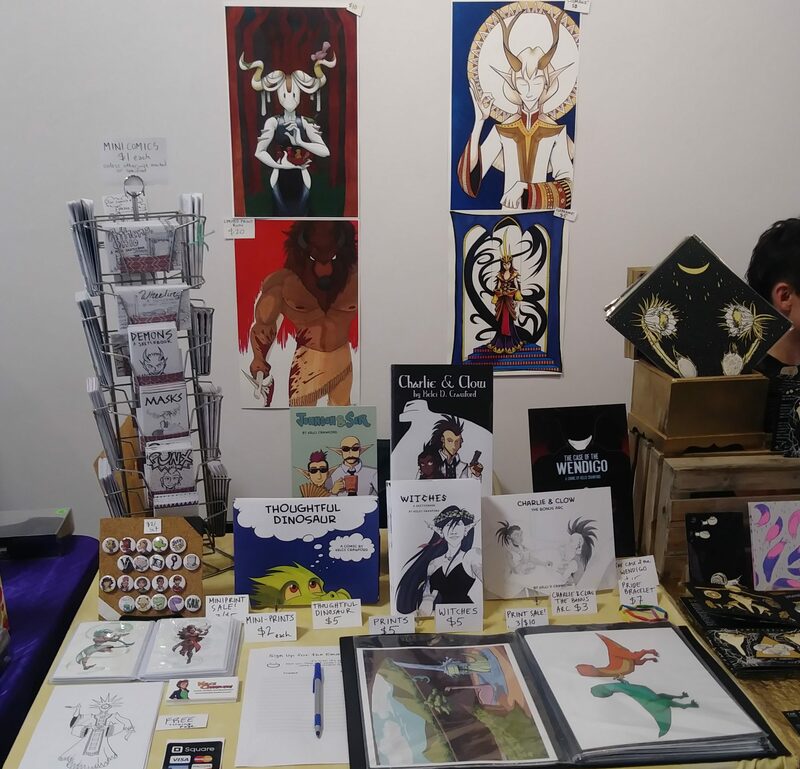 Lots of comics makers (and aspiring comics makers and other artists) read my blog. Is there anything you would like to say to them? If you have a story that you just need to create, don’t wait until you’re “good enough” to create it. You’ll get better through the process. It takes time, practice, and effort, but it will all pay off eventually. You can find Falconhyrste at falconhyrste.com. Be sure to follow Melissa on Twitter at @mcapriglioneart and co-creator Clara at @tenhousandbeez. Be sure to pledge on KickStarter to claim issue #4 of Falconhyrste (as well as other rewards).